The benefits of transcribing your videos and a step-by-step guide to doing so with Rev. Many community colleges have hundreds of video and audio files on their websites. More often than not, they do not include proper captioning or transcription. If your goal is to make your website accessible to everyone, regardless of disability, then it is crucial that you take the step to transcribe your videos. Transcribing videos isn’t just a great idea from an accessibility point of view. It’s also a great content marketing strategy. After all, what good is posting a video on your website if Google has no clue what the contents of the video is? By including a full transcription of the video within the webpage, you are feeding search engines with the textual content they desire. You also have to consider your various audiences. Some people love to watch videos and could care less about reading through text. Other people love scanning text at their own speed and are not big on playing videos. Videos can also be obtrusive to people who are browsing at work or working in a quiet space like a library. 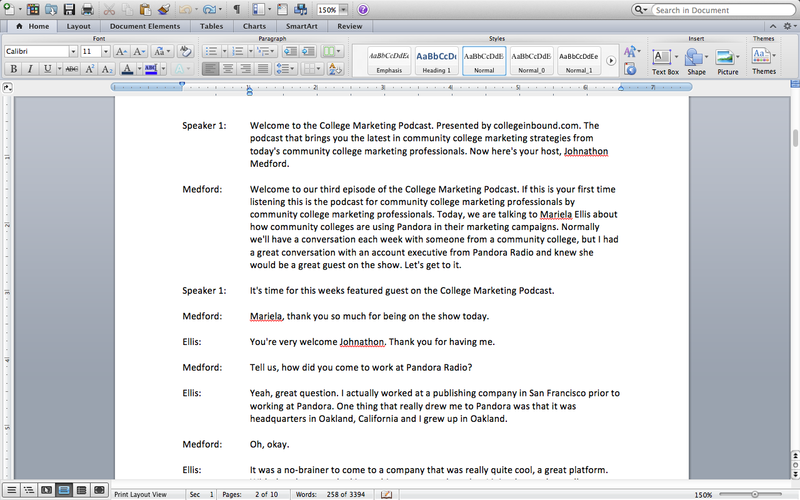 The biggest problem with transcribing your multimedia files is the enormous amount of time that it takes. Not to mention the fact that the process can become a bit tedious. If you are in a Director of Marketing or Director of Public Information role, transcribing videos is not the high-level strategic work that you should be focusing on. While you could potentially shift the workload to a new hire, it’s not likely transcription services would comprise a full- or part-time position. Which is why, today, I want to give you a step-by-step guide to the transcription service that we use, Rev.com. You can register for a free account here: https://www.rev.com/account/register. All they ask you for is your first and last name, email address, password, phone number and company. 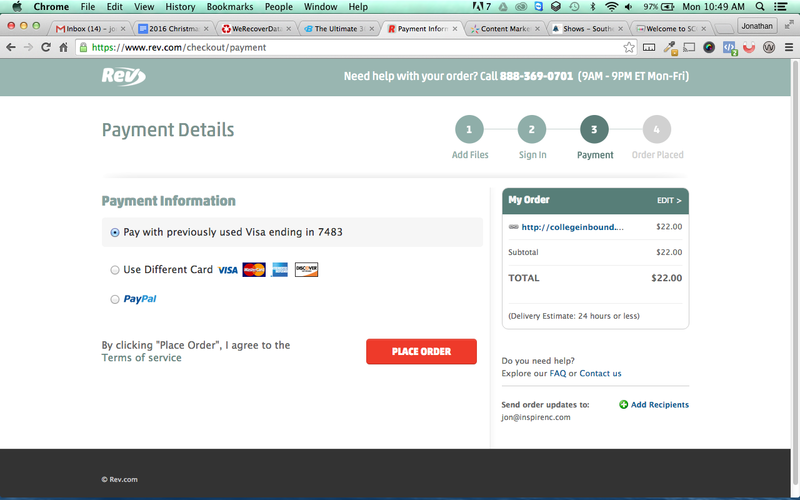 Login to your Rev.com account, go to your Order History, and click on Place New Order. Then choose Transcription. You will have a choice to upload a file or paste a URL to your multimedia. We usually post our podcast on our website, and then send Rev the URL. 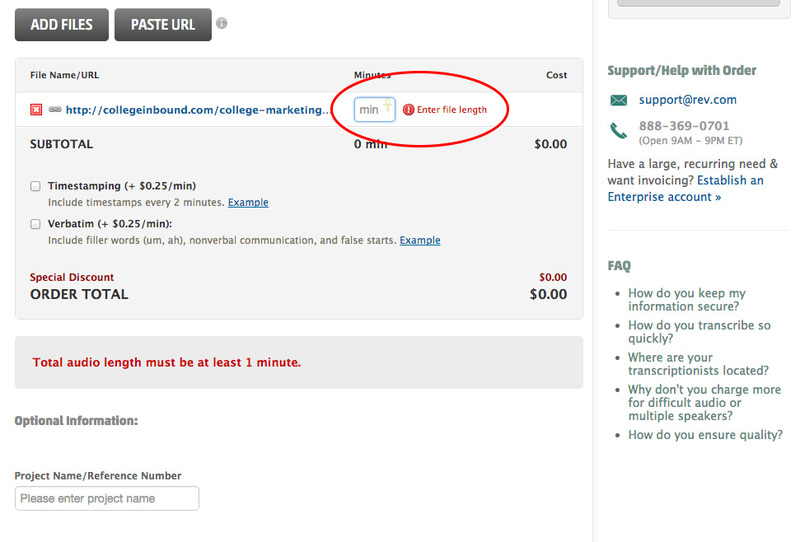 Rev charges $1 per minute of audio, so you will need to enter the file length in terms of minutes so that Rev.com can calculate how much to charge you for the transcription. You have several different options for payment methods including Paypal, Visa, Mastercard, American Express and Discover. If you submit your order early in the morning you might have your transcription ready by the end of the day. You are guaranteed to have your transcription within 24 hours of submitting it. The transcriptionist assigned to your project will provide you with a Word document. Open it up and start reviewing the content for accuracy. I have been really impressed so far with the thoroughness of their transcriptions, but it is still important to review each line as you will certainly come across mistakes that are usually understandable. 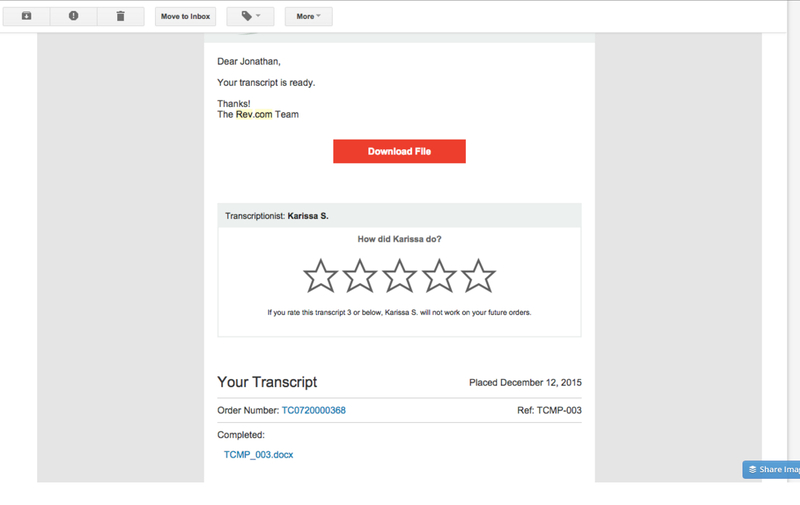 The name of the transcriptionist will be made available to you along with a 5-star rating system. If you rate your transcriptionist a 3 or below, they will not longer be assigned to work on your projects. 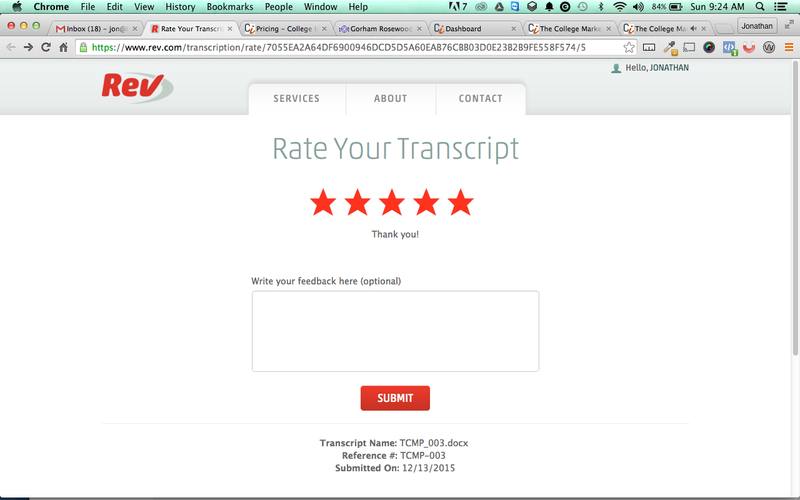 You are also able to provide them with feedback that you think would help them in improving their transcriptions. What are the next steps your community college should take? For community colleges with an extensive library of multimedia content to transcribe, my recommendation would be to start with the goal of transcribing all new multimedia content that is created. From there, you can focus on chipping away at older content. I would just be careful with getting too carried away with transcribing content that is so old that it makes little sense to hang onto it. Make your site a wealth of information, but don’t clutter it with content that is so dated that it detracts from your credibility as an information source. How is your community college tackling this issue? Leave your questions and comments below!